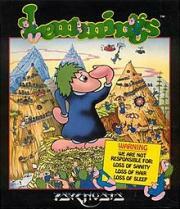 The objective of the game is to guide a group of anthropomorphised lemmings through a number of obstacles to a designated exit. To save the required number of lemmings to win, one must determine how to assign a limited number of eight different skills to specific lemmings that allow the selected lemming to alter the landscape, to affect the behaviour of other lemmings, or to clear obstacles to create a safe passage for the rest of the lemmings. 8th grade GATE class, this was installed on a few of the computers in the classroom. I never saw the appeal of it. I played this game. ' Very interesting. Endlessly addicting as a kid, the later levels truly made the brain itch something fierce. Never before or since has a game so strikingly illustrated a character trait.